"I'll just try to make my own relaxing music." After a long day, music helps people relax and unwind. The same may be said for cats, since soft, slow music can actually keep them calm and lower their stress levels. 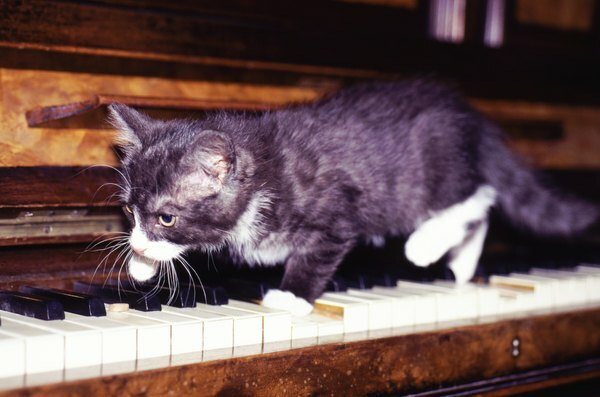 Play classical music or even music designed especially for felines to keep Whiskers happy. Just you do, your cat responds to different types of music with either agitation or relaxation, depending on the type of music and sounds played for her. Unlike humans, though, kitties tend to respond more to music designed especially for them, rather than music composed for humans. This music, referred to as "species specific," contains pitch, tones and tempo familiar to your kitty, based on his size and heart rate, Discovery Communications notes. As long as the tones played in the music fall within your kitty's vocal range, Smokey or Boots will respond to the music played for him. Of the music tested with cats, very simple classical music seemed to fit the bill, providing a calming effect, according to the American Humane Association. Slowly paced music with soothing tones seems to have a calming effect on kitties. In fact, the staff of the San Francisco Society for the Prevention of Cruelty to Animals plays classical music to calm their feline shelter residents. The music appears to have a soothing effect on new arrivals to the shelter, helping them to adjust to their new environment, as the music doesn't have a lot of percussion or dissonant tones, Cat Channel notes. Another type of music that appears to relax cats on vet visits is yoga meditation music. A student veterinary nurse discovered that meditation music appeared to lower stress levels for cats, notes the U.K.-based Telegraph. These kitties appeared to breathe more slowly and relax more quickly than those who weren't exposed to the music, even in a stressful vet's office. Simply playing music for your kitty won't necessarily relieve his stress, especially if that music is loud. Loud sounds or loud music can actually increase Snowball's stress level, even if that music is soothing in nature. Because classical music and yoga meditation music also has stress-relieving properties for humans, you might also begin to feel less stressed when listening to it with your kitty. Cats can be affected by your mood, especially if you're feeling stressed. By decreasing your stress levels, you in turn decrease the stress of your feline companions. For this reason, pick a type of soothing music to play that you both enjoy. Anxiety can cause a variety of health and behavioral issues for Patches, so it's important to do what you can to keep it to a minimum. You can play classical or meditation music to help your cat relax -- or obtain music designed specifically for them. Available online and in some pet supply stores, music composed for kitties usually features simplified classical tunes and music with a New Age feel. Including music in your kitty's routine may help with his behavioral issues or with stress related to a move or the addition of another pet to the home. Consult with your vet to rule out any medical issues with an anxiety-ridden kitty and try playing a few soft tunes for him to see if they will help to relieve her stress. WOSU Public Media: Can Classical Music Calm Your Cat? Researchers Think So! Discovery Communications: What Music Do Pets Prefer? How Do Cats Typically Behave? What Kind of Music Do Cats Prefer? Is Deicing Salt Dangerous to Cats?